Severe flooding across a large part of southern Thailand has killed more than a dozen people after several days of heavy rain. At least one person was reported missing. Most of the victims are said to be fishermen. The interior ministry said six days of floods had affected over half a million people. The main rail link to the south has been cut. 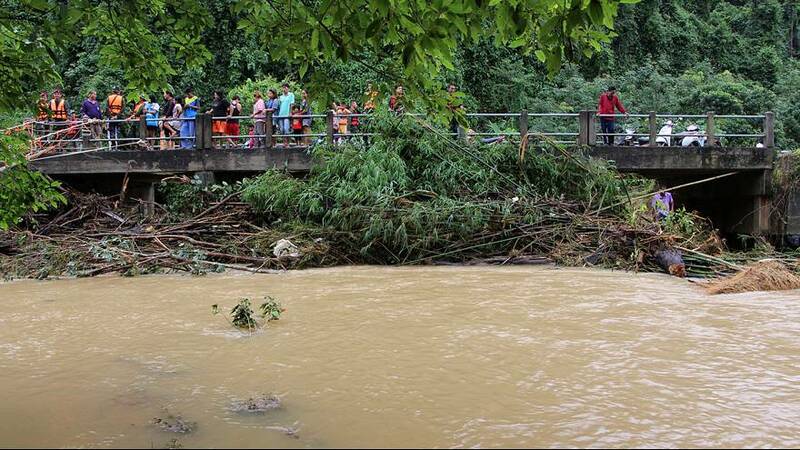 In Nakhon Si Thammarat where at least five people died, high seawater levels have been made worse by flash floods from the mountains. A state of natural disaster has been reported in eleven provinces, from Prachuap Khiri Khan in the northern part of the Malay peninsula down to Satun which borders Malaysia. The floods have struck just as Thailand enters the high season for tourism. On the island of Koh Samui boats have been laid on to get visitors to the airport for scheduled flights. The recent heavy rainfall is extremely unusual for this time of year: the rainy season runs from June to October. The floods have also affected the south of Myanmar and the north of Malaysia. According to Thai weather forecasts, more rain is expected in the region over the coming days.